Degus are little rodents that look like a cross between a chinchilla and a rat. They're usually a brown/ black colour, but can be grey as well. They have bright orange teeth, beady black eyes and a long tail with a fluffy tip. Compared to other small animals they aren't the friendliest of pets, but can be very rewarding to look after. Degus usually grow to about 25 centimetres (including tail), and weigh up to 300 grams and can live for about 5 years as pets (longer in their natural environment). They have 5 claws on each foot, 20 teeth (only 4 of which are visible to us without rooting around in there - which you wouldn't want to do!) Their teeth are capable of chewing through wood, plastic, muscle and any type of food packaging. You can check their health just by looking at their teeth - if they're not orange you've got an unhealthy degu. Usual degu sounds are a high pitched squeaking if they're happy, squealing if scared, and chattering of the teeth if they're angry. If they're making the chattering sound that is the time to move away. As I've already mentioned, their teeth are sharp! They're rediculously fast, with the ability to climb vertically, up wire cages and between furniture. Their feet act like claws, which helps them climb and carry food around; this is ideal because they love to hoard food in hard to reach places. It's adorable to watch them pick a nut out of your hand, then sprint off behind a radiator to store it! It's like they honestly think you're going to steal it from them. Of course, they're generally sneaky when it comes to their food. I constantly find their food dish empty, fill it up again and find all their food hidden around the room. You have to be careful with what you feed a degu. They are vegetarian, and vulnerable to diabetes, so no sugar. This sounds simple, but so many rodent treats are coated in honey or syrup, and contain fruit. Those are definite no-nos for these guys. They can be fed special degu chunks, but these tend to be a bit expensive so guinea pig pellets are fine. They love treats of nuts and porridge, and there are loads of degu friendly nibbles available too - such as parsley bells and Ryvita crackers! (Ok, Ryvita crackers are meant for humans, but degus enjoy them way more than we do.) With my degus (Shadow and Storm, as seen in these pictures) nuts are such a valuable item that I'm not even trusted to watch them eat one. This is Storm defending his! Hay is also an important part of their diet. It's essential for maintaining healthy teeth and digestion. Fortunately they love it, so you can leave it in their cage and they'll snack on it whenever they choose. To make things fun for them you can hide hay in a sock and watch them battle to get it out. Degus need room to climb, it's in their nature. So any cages should be taller than they are wide. It's recommended that you allow one storey per degu, so two would need a two storey cage. You'll need a wire mesh cage, as degus can chew through all the others quicker than you'd think possible. Also, ensure that there are areas in the cage which are smooth. 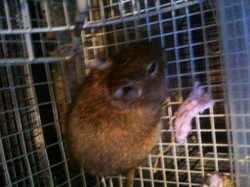 Degus can't walk on wire mesh all the time, or they'll suffer from Bumblefoot. Although that sounds cute, it's an incredibly painful condition where the degus feet will get swollen and sore. A solid metal floor with wire mesh on the rest of the cage is fine, as this means there's a smooth place for them to rest. You can leave degus to make their own beds, as they love nest building. Just leave some scraps of kitchen roll, paper or straw in with them and they'll take care of themselves. If you have more than one degu you'll need more than one food bowl. They get rather angsty about sharing food, so it makes things easier to give them seperate bowls (preferably with a bit of space between them). Water bowls aren't recommended as these can quickly get contaminated, so water bottles are best. They slot into the wire mesh of the cage easily. - Degus can get depression. If they're homed without a friend, or their friend dies they can suffer from depression and die sooner. - The tips of their tails come off! I only found this one out after trying to hold Storm for the first time. In his escape he left his tail fluff behind on the floor. I was horrified, and had already given him half a bug of nuts as an apology when I found out this is a defense for them. Also, Shadow chewed the tip off his own tail in sympathy - something which is common with degus. - They're survivors. They recover extremely quickly from injuries, which I suppose is a necessity as they can be quite violent towards each other. - They're diurnal, which means they'll sleep whenever you do! No scratching and squeaking while you're trying to get to sleep at night! - Although they are independent creatures, after a certain period of time (and a certain number of treats) they'll come to trust and love you. They'll often stand up and let you stroke them on the ears and belly. - They bathe in dust. You can buy degu/chincilla dust and a little bowl for them, and they go mad! They roll around, dig it up and bury food in it. So Do They Make a Good Pet? It's a bit of hard work owning a degu, and they aren't good pets for young children, but in the end it's completely worth it. They'll keep you entertained for hours with their antics, and you can have fun setting them little challenges, such as food mazes and toys. I've had mine for 4 years and would definitely recommend it! Some of the things reminded me of the gerbils that we've had. They sound like cute pets. Good point, I missed out the need to keep degus occupied. They get bored really easily, so it's a good idea to give them plenty of toys and time outside the cage. I've found they really enjoy bird toys as well as ones meant for degus. Thanks for the comment! Degus are really cute. I find a bit surprising they live longer in nature than in cages but this fits with their characters. If they empathise with their companions and suffer from depression, this makes more sense. I guess their owners should invest some time to keep degus busy. Boredom should not be allowed, right? thanks for reading guys, I love any opportunity to talk about degus!